At last! You can posses the power over any man or woman! ... Posses power over the forces that control good luck ... The power to get whatever you want in life - all through the magick of spellcraft! Through the magick power of CASTING SPELLS your heart's desires can be fulfilled! From time immemorial there have been those who in secret have invoked the spirit forces that control love, luck, health and prosperity. Beginning NOW you can do the same, and enjoy a life filled with endless good fortune! 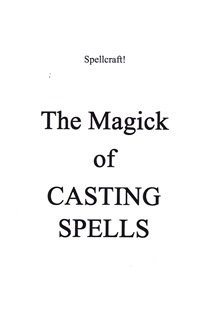 Marcus Bottomley's new book 'The Magick Of CASTING SPELLS' reveals how to make it happen! You can now cast a spell on any man or woman to make them want you! YOU CAN MAKE SOMEONE WHO HAS GROWN COLD LOVE YOU AGAIN. You can make someone love you forever! These magick spells are irresistable! In these spells you summon the great spirit beings who make what you want happen! Through Spellcraft you control those forces which in turn control the things you want. IMAGINE THESE THINGS: The power to make someone your love slave!... The power to make money flood into your life - beginning within days!... The power to make people do your bidding!... The power to control disease and bring health!... The power to protect yourself and loved ones from physical harm and injury! With the help of this book you can now truly possess this power! You can practise SPELLCRAFT in the privacy of your own home. NO LONGER CAN ANYONE GET THE BETTER OF YOU - you will always have this magick power at your disposal! This new book shows HOW TO GET THIS POWER - QUICKLY! Almost anyone can cast spells to get powerful, fast results! In this book are centuries-old powerful secrets for OBTAINING MINEY AND WEALTH BY MAGICKAL MEANS; AND FOR CONTROLLING PERSONS THROUGH THE UNOPPOSED FORCES OF MAGICK. No experience is needed! The spells are safe to do! You summon spirits that will only help you; and these magickal spells give you control of them! The age-old magick secrets in this book could not have lasted for centuries if they were ineffectual. You can cast spells every day to ensure constant good luck. Cast a spell to make someone fall in love with you! SPELLCRAFT WORKS - because it invokes the spirits that control life's fortunes. THIS BOOK GIVES YOU ACTUAL NAMES OF THESE SPIRITS WHO ARE READY TO DO YOUR BIDDING. You are shown the actual words that control these forces. Get magick spellcraft working for you now.